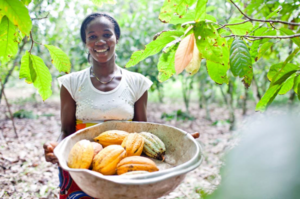 MINNEAPOLIS, Nov. 16 /CSRwire/ - General Mills joins leading companies in an agreement to end deforestation, protect national parks from illegal cocoa production and develop alternative livelihoods for affected smallholder farmers in Cote d’Ivoire and Ghana. The two countries produce nearly two-thirds of the world’s annual supply of cocoa. The far-reaching joint Frameworks for Action, led by the World Cocoa Foundation, was announced today at the UN Climate Change Conference (COP23) in Bonn, Germany. Cocoa is one of General Mills ten priority ingredients, which the company has committed to 100 percent sustainably source by 2020. More than 70 percent of the cocoa General Mills buys is grown in West African countries including Cote d’Ivoire and Ghana. The Frameworks for Action were developed through an extensive, multi-stakeholder process that brought together two national governments, private sector, including farmer and farmers’ organizations, national and international civil society organizations, development partners, and other stakeholders in Cote d’Ivoire and Ghana, and at the global level. Community engagement and social inclusion: this covers social safeguards through civil society and community engagement. For more information on General Mills’ commitment to sustainably sourcing cocoa, visit its 2017 Global Responsibility Report and Taste of General Mills blog. General Mills is a leading global food company that serves the world by making food people love. Its brands include Cheerios, Annie's, Yoplait, Nature Valley, Fiber One, Häagen-Dazs, Betty Crocker, Pillsbury, Old El Paso, Wanchai Ferry, Yoki and more. Headquartered in Minneapolis, Minnesota, USA, General Mills generated fiscal 2017 consolidated net sales of US $15.6 billion, as well as another US $1.0 billion from its proportionate share of joint-venture net sales. For more information about General Mills, visit www.generalmills.com.